Images: Enger Tower by The Stamping Post. Bush by Art Impressions. Boulders w/Lichen by Stampscapes. Built of native bluestone in 1939. 60' high, 6 stories. Octagon shape. Built to honor Bert Enger who was a penniless Norwegian immigrant who became a prominent wealthy businessman. Check out http://www.northernimages.com/snapshot/enger/enger.html for details. Artists note: Your boulder stamps are ideal for scenes such as these. 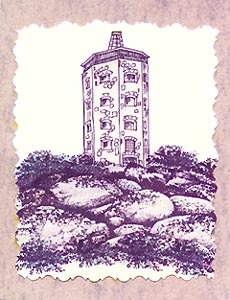 My earliest memories of Enger Tower are with the boulders and lichen at the base of the tower before the bushes grew up.